And the mad shall inherit the earth..
Céad míle fáilte mo thóin. Apologies to all you Gaeilgeoirí – “Is fearr Gaeilge briste, ná Bearla cliste”. Today the Irish Independent published an article which was just ‘shockin altogether’! 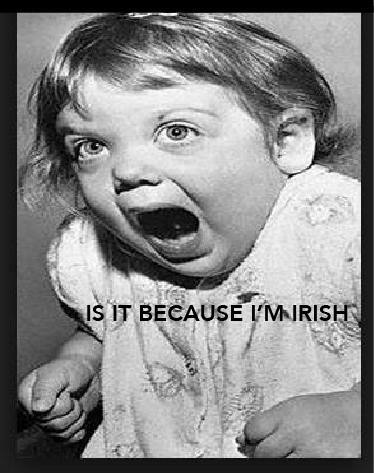 Sure aren’t we Irish just plain feckin mad? The article confirms what we suspected all along, that over half of Ireland’s youth “may have a form of mental health disorder“. Now pardon my stupidity but more than 50% of anything then becomes the majority, doesn’t it? So if over half of our young population have a ‘mental disorder’, does that mean that ‘mental illness’ is now the norm? Now there’s a further issue here, as the study was done in young people from schools in north Dublin, I wonder if it’s just northsiders who are mad – does it apply to my strange relations in Sallynoggin or are they in fact just bordering on insanity? Even worse, is it viral and will it spread out here to the friendly Wicklowites? Is that why the Stenaline axed the Dunlaoghaire to Hollyhead ferry, not because of any ‘ loss of revenue’ but instead to stop the spread of lunacy? It seems to be spreading at an incredible rate – considering in October 2013 (according to the Herald), ‘mental illness’ only affected 2 young people in 10, and now it’s spiralled to over 5 in 10. The Independent article states that “Other research shows that the family is central to the young person’s mental health” – so therefore, surely the Dubs must be doing a shockin shite job at parenting? The same article references the College of Psychiatry of Ireland as underlining “the importance of ‘early intervention’ in order to try to give young people the best chance to get on with having full, productive and normal lives”. This is where it gets seriously ridiculous (or ridiculously serious). How early is too early for Irish psychiatry’s medical model? Yesterday, amid the furore of Jeremy Clarkson and other important worldly news, a small article in the ‘Torquay Herald Express’ mentioned early intervention. The first line stated “authorities are to be asked to confirm the number of children in Torbay who are prescribed the anti-depressant Prozac”. The article referred to Councillor Julien Parrott and his fears for the number of 5 year olds (and older) being prescribed the antidepressant Prozac. I kid you not (no pun intended). Early intervention? Prozac doubles the risk of suicide, doubles the risk of violence, comes with a black-box warning in the US and another EU warning for the emergence of suicidality. Early intervention? Parents should be aware that the ‘early intervention’ programme is widely attributed to an Irish psychiatrist Patrick McGorry (living in Australia). In 2011 he found himself in hot water amid complaints that a study he was carrying out was unethical. 13 Australian and international experts lodged a formal complaint against him to stop this dubious drug trial from proceeding. The controversial study, which involved giving antipsychotic drugs to children as young as 15, was then aborted. I believe that so-called ‘early intervention’ leads to the dangerous drugging of innocent children and to more deaths. Do we really believe that the majority of Irish children are inherently mentally ill? C’mon – Leave our kids alone. Fág ár páistí mar atá siad. Who, When, Where and How..
Why did you do it – choose to die? Last week the Coroner for West Galway, Dr Ciaran MacLoughlin, conducted nine inquests in one day. What he found deeply disturbing was that seven of the deaths were self-inflicted. He said “Seven deaths, all bunched together. It is very alarming – it is a terrible tragedy … ” Brian McDonald’s excellent article provides an unusual insight into the deaths that were deemed to be suicide. The Coroner’s findings, while tragic, were not in fact unusual. In December 2011 another Coroner, this time in Wexford, performed inquests into the deaths of eight people. Again these inquests were all performed in one day – six were deemed to be suicide. I would argue, taking lunchtime and tea breaks into consideration, exactly how much investigation goes into finding ‘who, when, where and how’ a person has died? Would approximately an hour for each individual serve to bring justice for his/her death, or provide answers for the families left behind? The opportunity to find the common denominator in both of these Coroner’s courts was sadly overlooked. If, in the 13 ‘deaths by suicide’ recorded by these two Coroners, there is no common denominator, then we will probably never reduce the suicide rate. The millions earned and spent on suicide prevention and ‘mental health’ in this country might as well be turfed into the Liffey. Be under no illusion, suicide generates a lot of money worldwide and that includes Ireland. I suggest that answers will be found once bereaved families are asked to participate in suicide prevention. They could be asked to provide details of the deceased’s life, particularly of their final year. What events could explain their choice to die? Is it possible that Swedish medical writer Janne Larsson is correct, that the majority of suicide victims had been prescribed psychiatric drugs, known (despite the denial by Irish psychiatry) to double the risk of suicide? Is Declan Gilsenan (retired Irish Pathologist) right in saying that he believes that these drugs are causing suicides? He has said, of the last five autopsies he performed on suicide victims, 4 had been recently introduced to an ssri antidepressant. Is Professor David Healy (Irish psychopharmacologist and world-leading expert on these drugs) right when he says that these drugs are causing hundreds of Irish people to feel so desperate, that they choose death as the only way to escape the adverse effects of same? One thing is for sure, one miserable hour is not going to get to the bottom of why a person chose death instead of life. Is 60 minutes of a Coroner’s attention all that the family’s beloved one was worth? 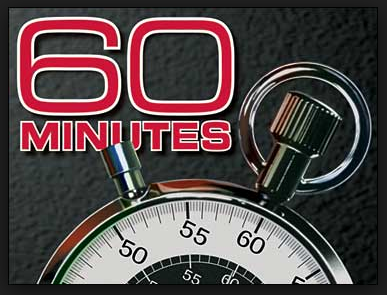 Is 60 minutes enough to determine whether akathisia played a part in a person’s demise? Nope, not a chance of it. It does beg the question though – if these inquests had a jury, along with a medical expert, would their deaths have been determined as suicide? Would the juries instead, as in my son’s inquest, have rejected a sucide verdict on account of the prescribed drug in his/her system? One thing is for sure, an hour to determine ‘who, when, where and how’ is, in my opinion, just adding insult to injury. TG4 – The Dark Side Of a Pill. TG4 has recently televised a brilliant documentary on SSRIs (Selective Serotonin ReUptake Inhibitors) – you know, the dangerous antidepressants I’m always on about. The drugs which can cause people to kill themselves and others, and did so in my son Shane’s case with Lundbeck’s SSRI Citalopram (aka cipramil/celexa). At this stage, Irish Psychiatry et al, who continue to deny that these drugs can cause suicide or violence, are looking pretty idiotic. I guess the pharma funded blinds go a long way to make up for ‘stupid’. Anyway, the link to the programme is here. I’m sorry to say it can only be viewed in Ireland and possibly on some iphones. The ‘Dark Side of a Pill’ is obviously a very recent programme as it involves the recent case of the Manitoba teenager who killed his friend. The Winnipeg judge ruled that he murdered his friend because of the effects of the SSRI Prozac. Brian of AntiDepAware wrote about the case here (March 25 2014). TG4; The Dark Side of a Pill. Leonie Fennell; Psychiatric Drugs: Evidence Based Medicine or Psychiatry’s Smoke Ball. PS. I have just been informed that it’s possible to view this in the UK on an iphone and possibly on an ipad. It can also be bought here for any Rockefellers out there. 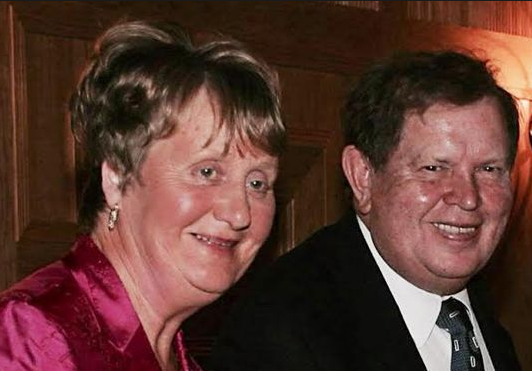 Jimmy and Kathleen Cuddihy – SSRI Induced? Yet again Ireland has suffered another horrific familicide. This time a retired couple, Jimmy and Kathleen Cuddihy from County Donegal, were found dead in their home. Their son Julian, a mechanical engineer, has been detained by Gardaí; an axe found at the family home is believed to be the murder weapon. The Irish Times reported that Julian Cuddihy had been ‘medically assessed recently after concerns were expressed about his mental health’. He had been found close to the scene with a legally held shotgun and was suicidal. Most of the newspapers reported that he had recently ‘suffered from depression’, as if this somehow explained the tragedy. More stated that there is no clear motive, that Julian was very close to his parents and that the community is in shock. One source said that there was ‘certainly no issue between himself and the parents’ and that ‘there was nothing to suggest that this was coming’. He further stated that the community’s heart goes out to Julian as well as his parents. Friends of Julian said that he had been ‘angry and agitated’ this week, which they found odd. The Irish Independent quoted a friend as saying “Julian is a normally quiet soul, well educated and articulate but he just didn’t appear to be himself in recent days”. So how then could this happen? As was the case with the other recent Irish familicides, Julian had recent ‘medical intervention’. What was he prescribed? Was he prescribed an SSRI (Selective Serotonin ReuUptake Inhibitor), known to double the risk of suicide and violence. If so, did the drug cause mania, psychosis or akathisia (a well known precursor to suicide and violence). Certainly the agitation Julian demonstrated points to akathisia. Was he prescribed an SSRI for the first time or was his medication changed while he was being accessed? This tragedy certainly seems to have all the hallmarks of an SSRI tragedy. Similar to the O’Driscoll and Skeffington tragedies, by all accounts Julian was a nice guy, this tragedy was ‘out of the blue’, was uncharacteristic and he had recently been ‘medically accessed’. The 3 experts who went to Leinster House and told Kathleen Lynch that SSRIs are causing many deaths, even suicide and homicide, may be shocked to realise that the Irish Government have done nothing. As with my son Shane’s case, if this Donegal tragedy is SSRI induced, as I suspect it is, the Irish Government should hang their heads in shame. My sincere condolences to the Cuddihy family. For more information, see RxISK.org, Peter Gøtzsche et al and fellow Irishman Professor David Healy. Psychiatric Drugs: Evidence Based Medicine or Psychiatry’s Smoke Ball. George Werb, Another Iatrogenic Death? How many dead children does it take before the medicine regulators take action? How many parents screaming ‘STOP’ will it take before this medication madness is banned? This week another inquest sheds light on the dangers of prescribing SSRIs (Selective Serotonin Re-uptake Inhibitors) to children. George Werb was 15 when he was admitted to the Priory Hospital in Southampton. He had previously been prescribed Olanzapine/Zyprexa and expressed concern that he was suffering from adverse effects of the drug. George’s parents also expressed concern that the drugs were harming him and asked for him to be taken off them. His mother, Joanne Werb, told his psychiatrist (Dr Carlos Hoyos) of George’s desperation to come off Olanzapine. Despite this, George and his parents’ concerns were ignored, the drugs were increased and Fluoxetine/Prozac was added to the mix. According to this article, George had previously had an adverse reaction to fluoxetine, yet inexplicably he was prescribed it again and sent home. The following day (28/June/2013) George stepped in front of a train and was killed. Defending his position, Dr Hoyos explained that “there is no significant evidence that the particular anti-depressants George was prescribed caused suicidal tendencies”. Seriously, what an absolute idiot! Dr Hoyos should be struck off for that one ill-informed sentence. If Dr Hoyos would care to open a packet of Fluoxetine, he would find a reference to suicidal tendencies in the PIL. I guess the supposed ‘expert’ never read the warnings or heard of a black-box then? Sadly for George, the ‘expert’ was no expert. 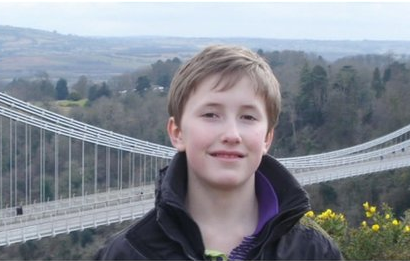 Similar to Tom Boomer’s family (Tom aged 14), George’s family said at no time were the risks of starting Fluoxetine or the risk of suicide discussed. Again, Maria Bradshaw whose son Toran (aged 17) died from a Prozac induced death, was not informed that SSRIs doubled the risk of suicide and violence. The drug company in Toran’s case (Mylan) admitted that Prozac was the ‘probable cause’ of his death. Despite the dire FDA and EMA warnings of prescribing antidepressants to children, there is widespread opinion among GPs and Psychiatry that Prozac is safer than other SSRIs in Paediatrics. ‘Not so’ according to Dr David Healy, the leading expert in SSRIs. He stated that “Prozac is no safer than other SSRIs for children“. So how many children will have to die before the multiple evidence before our eyes is believed? Adverse Reaction to SSRIs, Cases, Newspaper and internet articles, Shanes story. Barely 6 weeks after the awful tragedy in Sligo, where Shane Skeffington (20) killed his little brother Brandon (9) and himself, Ireland is once again dealing with a shocking murder/suicide involving young brothers. 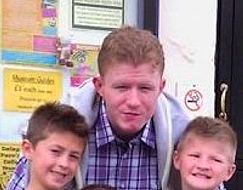 Jonathan O’Driscoll, aged 21, killed his twin brothers Thomas and Paddy (aged 9) and then himself, this time in Cork. The media are divided, one newspaper states that the Gardaí believe “Jonathan flipped and killed the tragic youngsters in a spur-of-the-moment attack” while another states that the Gardaí “strongly suspected that Jonathan’s murderous last act was not a spontaneous violent combustion from a mentally ill man, but something he had planned, possibly for some time”. Reports state that Jonathan ‘doted on his younger brothers’, that all three were ‘very close’ and that ‘Jonathan made the whole family happy’. So why then did this happen? Some reports have suggested that Jonathan was a troubled young man who was ‘fixated’ with being an adopted son, while the two boys were biological children. One newspaper reported that Gardaí were investigating whether he killed his brothers ‘in a jealous rage after learning he was adopted’, but this theory was later discounted by insiders. There are similarities between the O’Driscoll and Skeffington tragedies. In Sligo, Shane Skeffington had been receiving psychiatric treatment in the days before he killed his brother and himself. In Cork, Jonathan O’Driscoll was also receiving psychiatric treatment before he killed his brothers and himself. According to the Irish Times, he had also ‘recently engaged’ with mental health services. Another newspaper reported that Jonathan was “on a lot of medication and he had various health issues”. A recent article by Paul Gilligan, chief executive of St Patrick’s Mental Health Services in Dublin, stated that murder-suicides are “not typically associated with mental health difficulties”. He stated that these incidents “require a great deal more premeditation and planning” than suicide alone and places the blame solely on the perpetrator: Article here. So if, as according to Mr Gilligan, murder-suicide is not caused by ‘mental health’ issues, are we to assume that Shane Skeffington and Jonathan O’Driscoll were evil murderers? I do not believe that for one second. What of the ‘care’ that these young men received shortly before these tragedies? Is it co-incidental that mental health drugs, usually SSRIs, double the risk of suicide and violence? Is it coincidental that the European Medicines Agency have warned of suicide and violence with these drugs and that they come with a black-boxed warning in the U.S.? If these young men did not suffer from mental health issues, as Mr Gilligan suggests, then any drugs prescribed to these young men were wrongly prescribed. As a mother directly affected by a similar tragedy, whose son was also ‘recently prescribed’ these drugs beforehand, I feel a thorough investigation is required. We have learned a lot since my son’s death in 2009. I have complied this information here for anyone who’s interested. Rest in peace to all these boys. Considering Irish Psychiatrys’ usual defense of psychiatric drugs, it comes as no surprise that Mr Gilligan’s article has pride of place on their website, here. How Many Coroners to turn on that lightbulb? Robin Williams’ close friends have expressed the opinion that the drugs he was prescribed caused his suicide. Following his death, the media frenzy has once again brought ‘mental illness’ to the forefront of peoples’ minds. Opinions have varied hugely, ranging from the unfounded – “vastly underdiagnosed ‘chemical’ depression” to the over-simplification “if [suicide victims] could see the impact their death has had on those left behind, they’d know that their life had value and meaning”. Despite the opinions of Robin Williams’ close friends, his death has been used to promote the unfounded ‘chemical imbalance’ puffery and push pills to correct this said ‘imbalance’ – a travesty in my opinion. One article quoted Dr David Husted of the JFK Medical Centre psychiatry program, who said “..the general public often doesn’t understand about depression: It’s all connected to brain chemistry. Essentially, there’s a ‘glitch’…”. He went on to state that “depression is treatable if people are willing to give treatments — which include therapy and antidepressant medications – a chance”. So what if Robin Williams’ friends are right and the drugs are killing people? This March two different coroners, one in the UK and one in Ireland, expressed concerns regarding antidepressants and their ability to induce suicide. It seems that more and more coroners are willing to speak out about prescription drug-induced suicide. Recently, Jacqueline Lake (a UK coroner), sent a report to the NHS regarding the death and subsequent inquest of Susan Poore, aged 65, from Norfolk. This report has been released online. A regulation 28 report can be filed by a UK coroner, if, following an inquest, he/she perceives a risk of future similar deaths. A coroner has a duty to write a report under regulation 28 of the Coroners (Inquests) Regulations 2013, where there is a risk of further deaths occurring in similar circumstances as the deceased. In Mrs Poore’s inquest report, the coroner raised concerns over the effect that the prescription drugs had on her. Mrs Poore was prescribed Mirtazapine on 29th March 2012. 4 weeks later this antidepressant was stopped and changed to the SSRI Fluoxetine (prozac). 10 days later Mrs Poore walked in front of a train and was killed instantly. The coroner stated in her report that the ‘mode of death’ was out of character for Mrs Poore and that her depression deteriorated following the prescription of antidepressant drugs. While researching regulation 28 reports, I came across another report which was sent by a different coroner, also to the NHS. Nine weeks before Mrs Poore died, a young man in a young offenders institute also died by suicide. Jordon Anthony Buckton, aged 20, was also prescribed Fluoxetine/Prozac a month before his death. Dorset coroner, Sheriff Stanhope Payne, raised a number of concerns in his report, including that the deceased was never monitored for the emergence of suicidality. Despite the warnings of increased suicidality with all SSRIs, including Prozac, the GP who prescribed the drug to Jordan never actually met him or even checked to ensure he was doing okay. Despite never seeing Jordan, she stated that she ‘felt he was depressed’. An expert witness also gave evidence at the inquest that the NICE guidlines recommend monitoring following the prescription of antidepressants. So, two suicides, same drug, same time scale, same steps taken – absolutely none! So I ask again, how many coroners will it take? Will Robin Williams’s death serve as the catalyst for opening peoples’ eyes to the dangers of prescription drugs; a posthumous starring role in ‘awakenings the sequel’? Coroner Jacqueline Lake’s Reg 28 Report. Coroner Sheriff Stanhope Payne’s Reg 28 Report. Friend’s opinion on Robin Williams’ death here and here. A list of all the coroners who have raised concerns regarding prescription drugs will be compiled very soon.